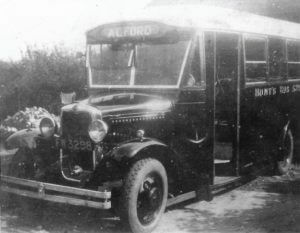 Fred started by operating a three times daily bus service to the market town of Boston. He soon built up a loyal following. With an ambition to build the business Fred Hunt continued to expand, buying out other local bus operators. By 1941 Hunts was operating 16 vehicles. These vehicles transported workers to the local factories, school children to the local schools and provided vital links to the larger towns. Soon after the war he started planning holiday tours throughout England and Scotland. This is a tradition that has continued to this day. During the 1960’s a petrol station was also built and a repair centre for commercial vehicles – now a familiar landmark in the town. In the 1970’s Fred’s sons Charles and Michael took over the business and continued to build and develop the entire company. They built a network of bus services as well as a programme of holidays and excursions using modern touring coaches.